This is the sixth in a series of profiles on Fox Chapel Sports Hall of Fame 2017 inductees. The banquet will be June 3 at The Harmar House. There will be a cash bar and silent auction at 5 p.m. with a buffet dinner at 6. For more information, contact Jim Perry at gymbeck63@aol.com. 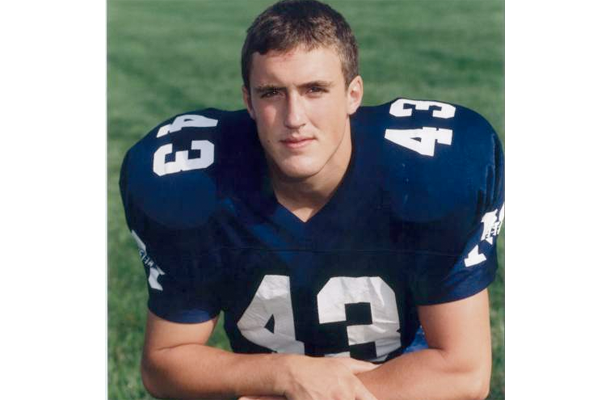 Aaron Barbour, a 1997 Fox Chapel graduate, excelled in three sports — football, wrestling and lacrosse. He played football all four years, wrestled for three years and played lacrosse for a year. In football, he was named to the Class AAAA East all-conference team on offense and defense as a junior and senior. He was selected to the North Hills News Record 1995 all-area defensive team as well as the Valley News Dispatch 1996 all-star team as he helped lead the Foxes to the 1996 WPIAL playoffs. He was a three-year starter in football, playing quarterback and defensive back. As a wrestler, he qualified for WPIALs and received conference honorable mention as a defender in lacrosse. He went on to play at Marietta College and started on defense as a freshman and won the Dutch White Outstanding Freshman award. Barbour, who lives in the Fox Chapel area and works as a service manager for Cintas Corporation, was pleasantly surprised upon hearing he would be inducted. He has fond memories of his time on the football field. “Football was life, and my teammates were my family in high school. We lived to play on Friday nights and compete at a high level to prove that we belonged as a Quad-A elite team. My fondest memories from my playing days come from the camaraderie among our teammates and coaching staff and training staff. I was very lucky to be part of these teams with such a high engagement level regarding everyone involved. “I was also lucky enough to play from the age of six years old with my brother Sean Barbour throughout all of my playing days until college. I also had the honor of playing for Joe Naunchik, who is a legendary football coach whose resume speaks for itself. Before the new stadium was erected, we played in many foul-weather games which are also fond memories. This became our home-field advantage over the years. Barbour is married with two children, and he’s kept in touch with several teammates, including Ron Valenty, Chad Killian and Steve McKenna. He spent time coaching in the early 2000s and takes his family to Fox Chapel sporting events.